Eastern Suffolk BOCES became the first intermediate educational agency to be accredited by the Middle States Association of Colleges and Schools. The accreditation represents our organization's commitment to Strategic Planning and providing services that meet rigorous external standards. We are proud of this accomplishment and are willing to help other organizations grow and improve through this accreditation process. Highlights of our MSA re-accreditation process and accomplishments follow in the presentation below. The Strategic Planning process was initiated at Eastern Suffolk BOCES in November 1998 by a Board action adopting six agency-wide goals guiding Eastern Suffolk BOCES through the year 2000. One of these goals focused on the introduction of the strategic planning process. Since then, new goals have been adopted and revisions made, with strategic planning a continuous focus. There are currently twelve goals for the 2009-16 period. 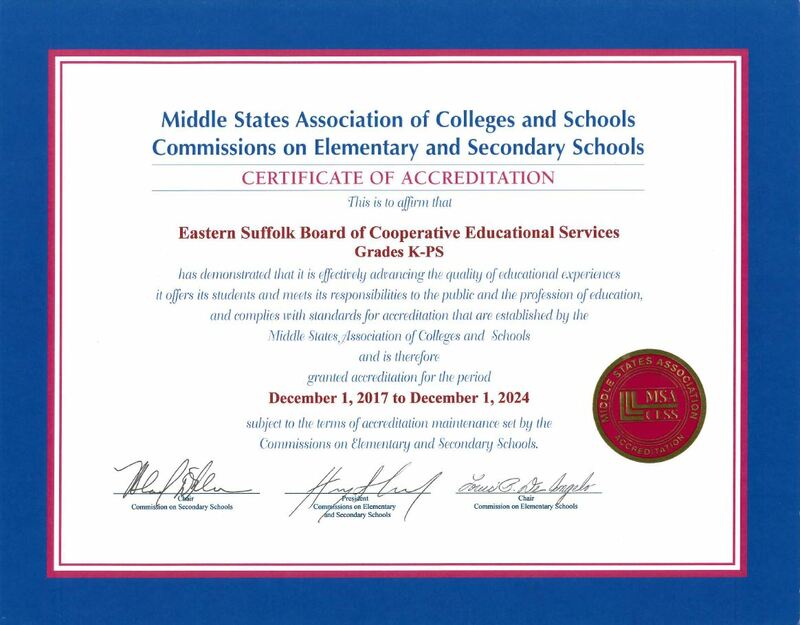 A major advantage of implementing strategic planning for organizational improvement at Eastern Suffolk BOCES is the agency's accreditation from the Middle States Association. The primary benefit of accreditation by the Middle States Association (MSA) is that it encourages and facilitates improvement by providing public accountability, stakeholder involvement and commitment, and validation by an external review team. The focus of accreditation is growth toward self-defined goals; it is a widespread process that involves the entire Agency and all of its stakeholders in a unified vision targeting areas of student growth and achievement. Eastern Suffolk BOCES was the first BOCES in the state to attain Middle States Accreditation and re-accreditation.